Seeking Capital for the Capital: Will India and China Jointly Fund Amaravati? The story of Amaravati went from a regional tussle to being part of global processes. Amaravati is planned as a “world-class smart city,” but to obtain this status, it will need the counsel and work of some of the world’s top companies. And, above all, it will need the money of some of the world’s biggest donors. On December 7 last year, the China-led Asian Infrastructure Investment Bank (AIIB) approved yet another investment project in India: the Andhra Pradesh Urban Water Supply and Septage Management Improvement Project. This is the ninth project approved by the bank for India, sustaining India’s position as the biggest beneficiary of the Beijing-created AIIB (provided that the projects will be realized, which is always a question). For me, there was never a contradiction between India’s rhetorical criticism of the Belt and Road Initiative (BRI) and the country being the AIIB’s top aid recipient (cf. also The Diplomat’s Ankit Panda’s comments on this). Contrary to the AIIB, of which India is a member, BRI is a vague initiative and not an organization; there is no membership, per se. Hence, there is no point in claiming which country is a part of BRI. The contradiction is even less apparent if we remember that contrary to what many think, financially, the AIIB is not a crucial part of the BRI. Most of the investment that it has declared so far does not compare in scale to the waves of loans with which other Chinese banks have flooded other countries. Pakistan, for instance, has borrowed far more from China than India, and thus the economic aspect of the bank does mostly overlap with the political one, rather than being contradictory to each other. One more future project in which the AIIB can add a small but notable contribution to India’s development is Amaravati (Amaravathi in the South Indian spelling). In 2014, the state of Telangana in southern India was carved out of the state of Andhra Pradesh (AP), following a decades-long struggle by the people of the backward Telangana region, who felt that they were not adequately supported by the state government. The Telangana issue highlighted the importance of the federal structure of India, where state governments have considerable power and the people of many regions wanted to feel represented in these power structures. But the creation of Telangana led to a new complication. So far, the capital of Andhra Pradesh was located in Hyderabad, a city in the Telangana region. The solution of a shared capital city had been already tried out in India. When the state of Haryana was separated from Punjab, the city of Chandigarh started to serve as capital of both. Chandigarh is an intriguing solution: it is a separate territory, which at the same time houses the administrative centers and courts of two states. But Chandigarh is located on the border of Punjab and Haryana while Hyderabad is within Telangana. Thus, the AP government and its Chief Minister Chandrababu Naidu decided to embark on an ambitious project: building a new capital city, Amaravati, from scratch. Like Chandigarh decades ago, the Amaravati project offers a chance to build a state-of-the-art capital, implementing modern solutions and making use of the experience of foreign architects and firms. Naidu wants Amaravati to be modeled on Singapore, but 10 times bigger. So far, however, not much has been built. Such projects admittedly take a lot of time and even more money, which so far has been unavailable. Naidu expected the Indian central government to support the project financially to a huge degree. For the past years, he struggled to obtain a special status for his state, which would mean that New Delhi would cover a significant part of the costs of development. Disenchanted when this was not conferred, Naidu’s party, the Telugu Desam Party, quit the coalition ruling in New Delhi in March 2018. 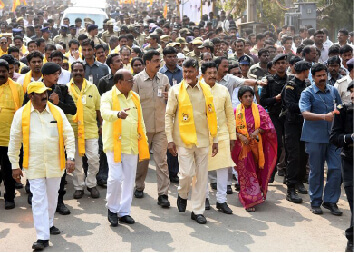 Some believe Naidu focused too much on his Amaravati dream, neglecting other fronts and regions. “I want to host the Olympics at Amaravati in the near future,” Naidu once said. He also engaged a famous AP film director, S.S. Rajamouli, known for his grandiose style, to give advice to the architects. The AP government also remained in talks with the World Bank to obtain a loan. As the central government funding will be lower than Naidu expected, such external assistance turned out to be even more crucial. As is common with such huge and inchoate projects, the estimate of the total costs swings like a pendulum, and may rise in the coming years. According to various sources, the AP government had sought from $600 million to $1 billion from the World Bank. The bank is biding its time, however, and the amount under consideration now is $500 million. The bank’s commission visited India in 2018, but later it was claimed that no decision will be taken by 2019. On December 29, 2018, at least one Indian newspaper (the Indian Express) claimed that the loan was approved, but it is better to wait for official confirmation. The loan would in fact be jointly covered by the World Bank ($300 million) and the AIIB ($200 million). The websites of both the World Bank and the AIIB confirm this. This is not surprising: the AIIB usually cooperates with the World Bank. Why the banks are procrastinating is not known, however. Internally, some of the farmers complained to the World Bank commission that upon giving their land for the capital project, they had been promised property within the city, none of which is forthcoming so far (as the city is not built). The banks may also want to wait for the results of elections, as both the state of Andhra Pradesh and the entirety of India will go to polls by May 2019. I also do not know – and neither it is my field of expertise – whether and how the current tensions between the United States and China, with their global implications, could weigh on the World Bank-AIIB equation in terms of projects like Amaravati. Even voices coming from the bank seem to be contradictory. While the World Bank’s chief economist for Asia warned against large-scale Chinese loans in May this year, the bank has also published a shoddy report on the Belt and Road Initiative, whose research methods and one-sided praise have been rightly criticized by Matt Schrader of the Jamestown Foundation. At any rate, the Amaravati project confirmed China’s position as a global lender, to a point where it can engage its funds within a country like India, which has been so critical of Beijing’s foreign policy, and in a project that New Delhi itself will fund less. It will be curious to see Indian and Chinese money jointly developing the same city. It should still be remembered that the amount sought from the AIIB is not huge. $200 million cannot be taken as indication of Beijing’s significant influence, but it may be a small step for Chinese construction companies – who may hope to win some of the bids for Amaravati projects – to gain new ground and experience in India. Thus, the Amaravati project is interesting on three levels: on the regional/state one, where the inhabitants of Telangana wished to have a separate state, feeling that this would give them more development opportunities; on the national stage, where the funding for Amaravati caused a tussle between the central government and the one of Telangana and led the Telugu Desam Party to abandon the ruling coalition; and on the international stage, where seeking for more funds has put the AP government between two lenders – the World Bank and the AIIB.